Shades are an incredibly popular type of window covering as they suit almost all needs - they are energy efficient, offer light control and privacy, come in a variety of beautiful, unique designs, and pair well with home automation. The innovative light-diffusing sheers and shadings we offer transform light and provide UV protection for your furniture and artwork, which is especially important here under the Tucson sun. All of the Hunter Douglas window shades we offer are designed and custom-crafted in the U.S. with the highest level of quality. Best of all, every window treatment from Hunter Douglas is covered by their lifetime limited warranty. We’ve hand-picked some useful videos for you to watch on each product line we carry - so feel free to either read about them, or watch the videos to determine what is right for your home. These cellular shades are specifically engineered to provide beauty and energy efficiency at the window in both cold and warm climates. Their honeycomb construction traps air in distinct pockets, which creates insulation that can help lower your energy consumption and energy bills. These honeycomb shades were created in response to the energy crisis of the late 1970s. Their latest innovation in this line is a fabric that features a honeycomb-within-a-honeycomb design for even greater energy efficiency. In addition to this, they also have the most gap coverage around their edges possible, making for greater room darkening. The Duette Duolite® features two different fabrics or opacities of your choosing fused together to allow for gorgeous light and view-through during the day and room darkening while you sleep. For over 25 years, Silhouette® window coverings have been the leader in light diffusion with specially crafted fabrics that transform harsh sunlight into beautiful ambient light. With no cords or tapes, the sheer facings allow you to view through the vanes to the outside, while maintaining a discrete level of privacy. The brilliantly engineered shadings feature soft, adjustable S-shaped vanes that appear to be floating between two sheer fabrics. Simply tilt the vanes to achieve your desired level of light and privacy. Silhouette window shades diffuse strong incoming light and create a soft glow in your home. The white rear sheer obscures the view into your home, providing daytime privacy. Just as sunscreen protects your skin from the sun's damaging ultraviolet (UV) rays, Silhouette shadings help protect your room's interiors and add to the lifespan of your valuable possessions. Depending on your fabric choices, these window shades can filter out up to 88% of the sun’s harmful rays. 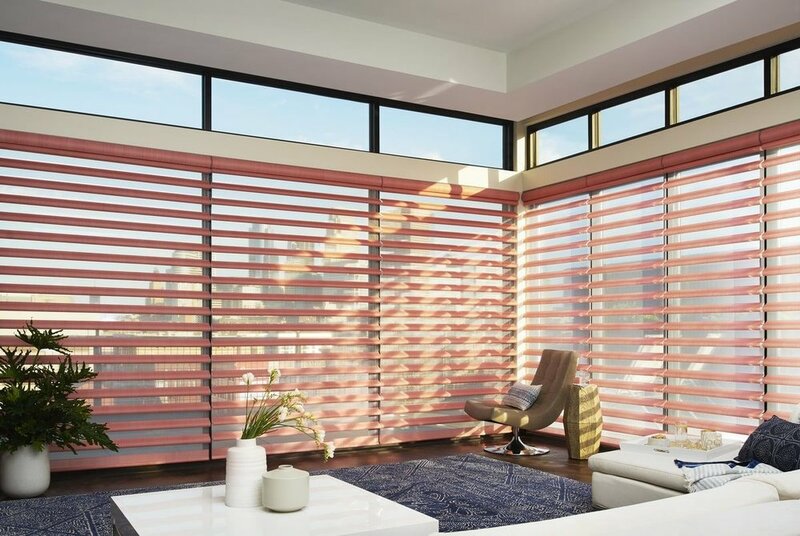 Hunter Douglas’ latest innovation, Silhouette ClearView™ Shadings, maximizes your view with a unique combination of front and back sheers for superior view-through. The Silhouette Duolite® product offers the light-diffusing benefits of a translucent Silhouette shading with an integrated room-darkening roller shade. Pirouette® shadings provide a bold and modern alternative to the look and feel of traditional fabric shades. Pirouette window coverings feature softly contoured fabric vanes that magically open and close to give you complete control over your desired degree of light filtration and privacy. Hunter Douglas’ revolutionary Invisi-Lift™ system allows the vanes to float gracefully on a single sheer backing. These window shades can be flattened for complete privacy or blossomed open to any position to invite incoming light and provide a view to the outside. They block up to 81% of harmful UV rays with the vanes open, and 99% with vanes closed to help protect your furnishings and extend their life. Pirouette window coverings are available with both semi-opaque and room-darkening fabric opacities, two vane sizes and a wide variety of colors to perfectly complement your room’s color palette. So no matter what your style or décor, there’s a striking Pirouette design that will work for you. The perfect Roman. Hunter Douglas created a Roman shade that has uniform, contoured or flat-fabric folds, and no exposed rear cords. They’ve eliminated all the issues from the standard Roman, and created a flawless modern window shade. Their dual-opacity option called the Duolite® is now available on the Vignette®, made to perfectly answer your desire for the best of both worlds—soft, natural light or soothing darkness. This special design combines a light-filtering or sheer front shade with a room-darkening back panel that both roll on a single roller. It’s day-night convenience at your fingertips. These shades have the look of beautiful sheer drapery panels, and the added bonus of vertical fabric vanes that rotate 180 degrees to provide unlimited light control and privacy options. Perfect for covering large windows and sliding glass doors, their superior UV protection meets both your decorating and practical needs. These also feature the Duolite® system for maximum light diffusing and room darkening effects during day and night. Clean, crisp and modern, Skyline® Gliding Window Panels offer a sleek answer for both large and small window expanses. Open, they stack tightly to offer the maximum view; closed, they display their rich fabrics and texture. These shades combine the ease and simplicity of a roller shade with hundreds of fabric choices—sheers to opaques, patterns to textures, and traditional solid colors. This stylish, modern window treatment boasts excellent UV protection while maintaining your view of the outdoors, available in varying levels of openness. Offering a minimal yet sophisticated look with light control, color and style, they are the perfect shade for any room in the home - even your patio or sunroom. The Sonnette™ window coverings gently diffuse light through an innovative curved shape, providing ambiance and character while dispersing light to all angles of the room. Made of woven and non-woven fabrics, Solera® create a fluid, sculpted look. It is a soft shade with cellular construction available in both light-filtering and room-darkening options. These are incredibly unique window coverings. Designer Banded Shades combine alternating sheer and solid fabric bands in a single shade. This design allows the shade to transition from open to closed seamlessly, providing a modern solution for view-through, light control and privacy. It's a roller shade and sheer shading, all in one. Hand-woven from natural fibers, Provenance® Woven Wood Shades add natural beauty creating a design story of light, texture, and color for every window in your home. Give us a call at (520) 355-4296 and make an appointment for our showroom or an in-home design consultation. Our hours are 10 am to 6 pm Mon - Thursday, 10 am to 5 pm Friday, and 10 am to 3 pm Saturday.